Pictured: The White Hots; Tina Albright, Aleks Disljenkovic, Ted Mosher and Steve Greene. 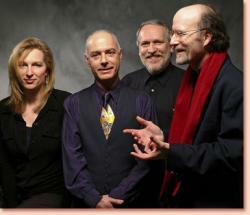 Ditch the cube and catch The White Hots at Hochstein at High Falls. Come enjoy lunch and an jazzy beat that is going to make you want to get up and dance! Named for one of Rochester’s gastronomic specialties, The White Hots are a blues, swing, and jazz group who perform everything from mellow instrumental music to swing dances with a full band. Musicians and music critics rave about them, dancers swing to them, and people who just like interesting music love their live shows and CDs. The band includes Tina Albright, vocals; Ted Mosher, bass; Aleksandar Disljenkovic, guitar; Steve Greene, guitar; Bill Blind, percussion.